EWG scientists reviewed Qet Botanicals Green Tea Mask with Raw Cacao for safety according to the methodology outlined in our Skin Deep Cosmetics Database. We assess the ingredients listed on the labels of personal care products based on data in toxicity and regulatory databases, government and health agency assessments and the open scientific literature. 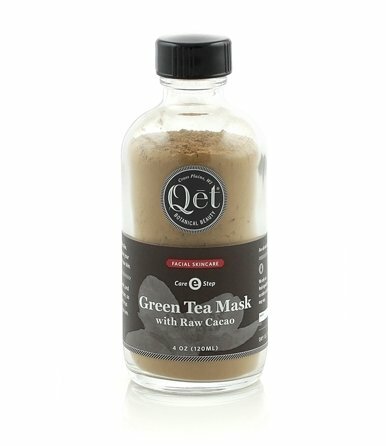 Qet Botanicals Green Tea Mask with Raw Cacao is EWG VERIFIED™. Sprinkle a small amount into our wooden mask bowl or palm of your hand. Add your favorite cleansing oil, or warm water, to make a paste and stir with the mask brush or your finger. Apply, wait for three to five minutes, and remove with a warm washcloth steam.